Brief Synopsis – After terrorists hijack a plane full of Americans, a special forces unit is sent to the Middle East to free the hostages. My Take on it – This is such a fun movie that take a typical action idea and takes it up one step. The idea to take a real event like a hijacking and making a film of how a rescue “should” have been done works really well eventhough it’s complete fiction. This film is able to take an action theme and move it up a notch by mixing in some dramatic and emotional scenes that raise the stakes of it all. The “selection” scene on the plane always brings tears to my eyes and it really wallops a punch with what they do with it. 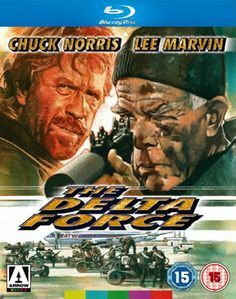 The cast is great and they are able to give us some great action characters like Chuck Norris and Lee Marvin with chessy dialogue and typical 80’s action but also manage to add in some great dramatic actors playing the passengers and hijackers. Joey Bishop, Martin Balsam, Lainie Kazan, George Kennedy, Robert Forster, Bo Svenson, Robert Vaughn and Shelly Winters are all superb here. The music of this film is so iconic and the fact that they now use it as a sports theme helps make it so enjoyable to listen to. Bottom Line – Great film that weaves the drama and action aspects of the story really well. The dramatic parts are so much more powerful tho because they are able to wallop an emotional punch. Great cast that features both action stars and dramatic ones. Music is amazing and feels so iconic. Recommended!